Since its inception, StraightVac has defined itself through its principals and expertise - and has let its values shape the StraightVac culture and brand. We're an industry leader, continually focusing on the advancement of our people, technology and services. We acknowledge our corporate responsibility to our own community, communities in which we do business, and our employees. Read more. 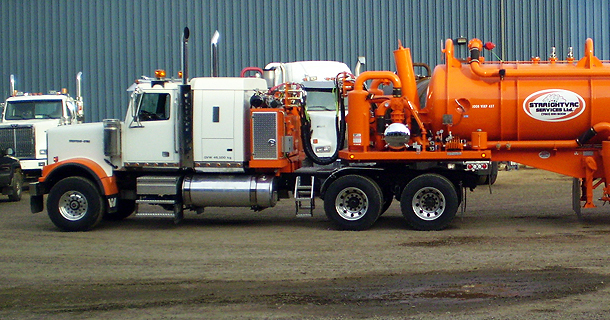 StraightVac provides its clients with professional vac units, water trucks, pressure trucks, steam trucks, hydro vacs, combo units, tankers, super-b's, b-trains and end-dumps. 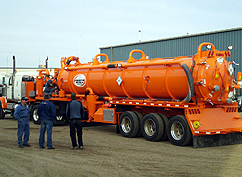 Our equipment permitted for hazardous and non-hazardous waste transportation. 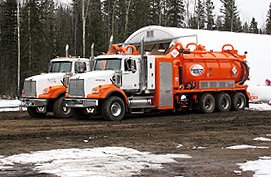 All equipment is maintained by highly trained personnel dedicated to providing each StraightVac client with safe, efficient, dependable and economical services. Each StraightVac unit is operated by dependable, professional, and properly trained field service operators. StraightVac's health and safety policies ensure these operators are certified for safe work procedures, hazard recognition and assessment and safe driving policies. Our skilled employees are the backbone of our company, and our exceptional service in the oil and gas industry is second to none. Read more.